Vulkamin improves the hygiene of the stable. The excellent absorption property of Vulkamin lowers cross contamination of unwanted pathogenic bacteria and is not abrasive to the udders or the cow body. By acting as a binding agent to the ammonia from the manure, Vulkamin improves the general environment of the stable including in a reduction of flies. 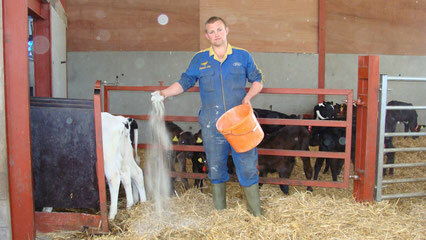 Vulkamin is rapidly becoming the preferred cubicle bedding powder used in animal husbandry. In both cubicles and loose housing systems the beneficial properties of Vulcamin are quickly noticed. 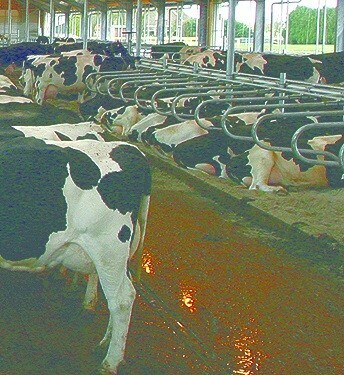 A daily application ensures optimal cubicle hygiene contributing to a prevention of cross contamination and mastitis. An extended benefit of using Vulkamin in animal housing is it’s rich source of nutrients, trace elements and soluble silicic acids. These components feed the soil when the slurry is spread. Vulcamin is part of the EM Agriton System for sustainable agriculture. The pH rises by 2% in 10 minutes. Soft texture of the powder is non-abrasive for the udders. Ground Stone (Basalt) Volcanic powder. Vulkamin is a primitive ground-stone volcanic powder with unique properties. It is made up of small particles and has a rich percentage of minerals and spoor elements which makes it a valuable product for agricultural uses. Not only a silky soft protective powder for teats but also laden with minerals which benefit the soil when spread.